As organizations get more distributed and the IT environment increasingly hybridized, it’s more important than ever to have visibility into the branch and other remote sites. Today, many site-to-site applications like VoIP or SaaS applications completely bypass traditional centralized monitoring in the data center and that means IT is essentially blind when problems happen. In the past, they’ve typically had to install smaller versions of dedicated monitoring appliances in the branch to get the visibility they need—an expensive and time-consuming proposition—or just go without. There is a superior and cost-effective solution to this problem. Use SteelHead or SteelFusion together with SteelCentral performance management. Many of our customers are already using this approach to better manage branch network traffic. In a recent survey, 80% of Riverbed customers identified WAN optimization, analysis and reporting as the number one use and 60% for troubleshooting branch office issues as second most common use (see Figure 1). Figure 1. 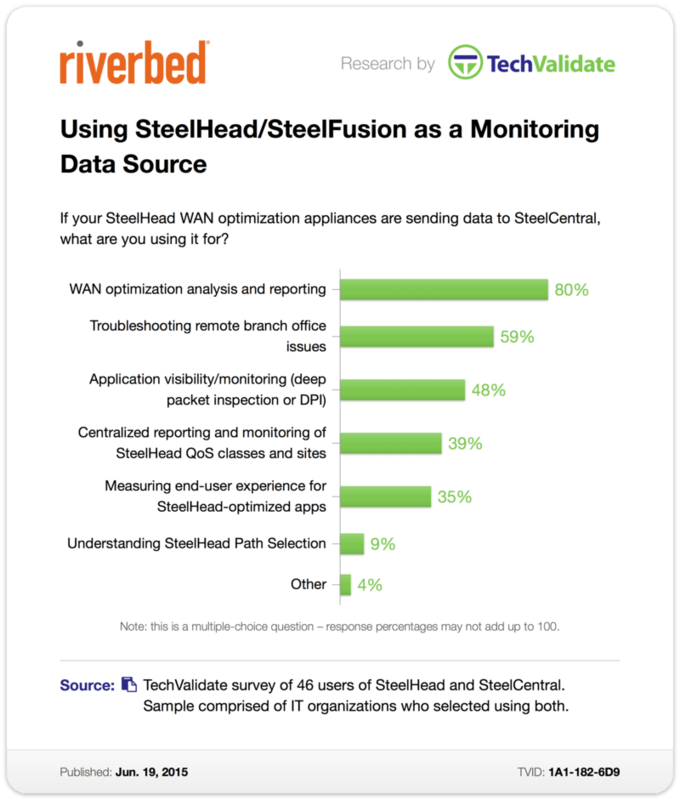 June 2015 TechValidate survey of joint SteelHead-SteelCentral users shows the top uses of NetProfiler for monitoring and troubleshooting optimized WAN performance. In addition to these capabilities, Riverbed also enables you to also use your SteelHead appliance to capture network packets out at the branch for fast, easy troubleshooting of those really gnarly problems. You’ve been able to run SteelCentral NetShark on SteelHead EX virtual software on your SteelHead box for several years now to turn it into a dual-purpose appliance that allows you to detect and fix performance problems! The great news is that we are now enabling those very same capabilities on SteelFusion Edge. Just like with SteelHead, SteelFusion Edge comes equipped with the Riverbed Virtual Services Platform (VSP), a protected partition where you can easily deploy and run all your branch office services virtually. The new SteelCentral NetShark Virtual for SteelFusion Edge runs on VSP and adds high-speed continuous packet capture capabilities to your SteelFusion Edge appliance. This enables cost-effective WAN monitoring and remote branch troubleshooting without the need for local IT resources or for dedicated branch monitoring appliances. Big bonus!!! Essentially, you get the ability to visualize, control and optimize branch performance in a single solution. See Table 1 for new SKUs and packet storage options. Table 1. New SteelCentral NetShark Virtual for SteelFusion Edge turns your SteelFusion Edge appliance into a high-speed continuous packet capture device and sends data to SteelCentral NetProfiler for centralized reporting and analysis. Figure 2. 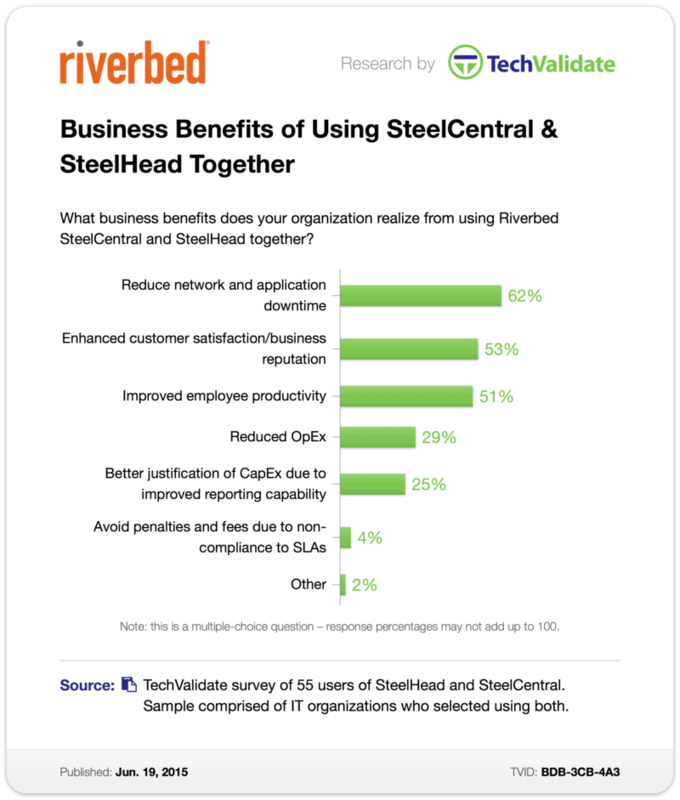 June 2015 TechValidate survey of joint SteelHead-SteelCentral users shows the benefits of using the solutions together. With SteelHead embedded in every SteelFusion and SteelCentral NetShark Virtual running on VSP, you now have a complete platform that re-architects the way enterprises are doing business at the front lines for increased IT agility in a Zero Branch IT environment.